Integration between Bus, MRTS, and railway is a vital need for the future. The city is planning two such major inter-modal interchanges. 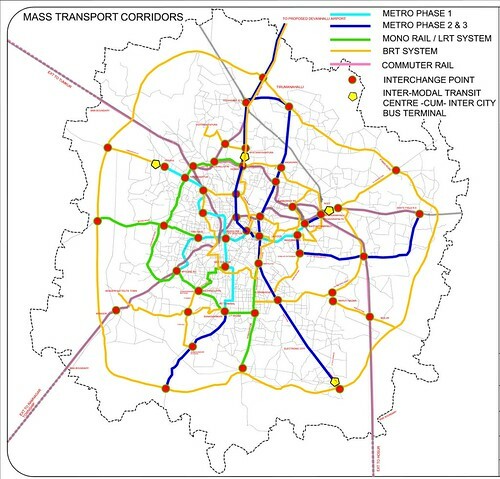 -- The first such interchange is already under bid – the Kempegowda bus terminus at Subhashnagar is proposed to be converted into an interchange that accommodates the BMTC, KSRTC, BMRC, and a “city center” complex. -- The second interchange is proposed at Baiyyappanahalli, which will have the BMTC, KSRTC, Railways, BMRC, and the Airport Rail Link. In addition to the above major 47 interchanges as indicated in Figure 7.1 are proposed at required intersections of mass transport corridors.